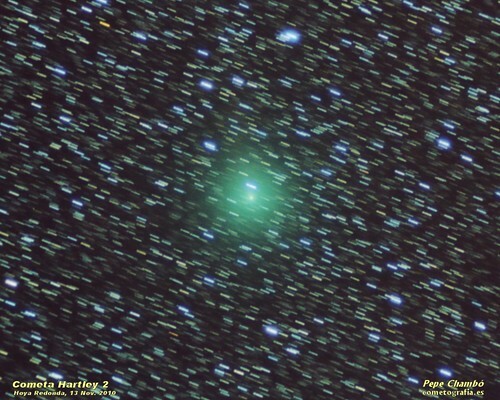 Discovered from Australia by Malcom Hartley at 1986, after orbit studies it's showed that this comet had been instaled on a short periode of 6.46 years after three encounters with Jupiter at 1947, 1971 and 1982. The 2010 apparition (in wich is taked this image) has been favorable because your aproximation to 0.12 AU to Earth reaching 5 rd magnitude, but with a big and fuzzy coma that did difficult your observation at naked eye. On November 4 the comet was overflown by space probe Deep Impact, taking detailed images of nucleus, emmission jets, and discovering a envelope of snow balls around the comet. In this photo stars are moved because comet's motion against them, and you can see a big coma of intense green colour with apparent width of Moon (0.5 deg. diameter), and without tail.